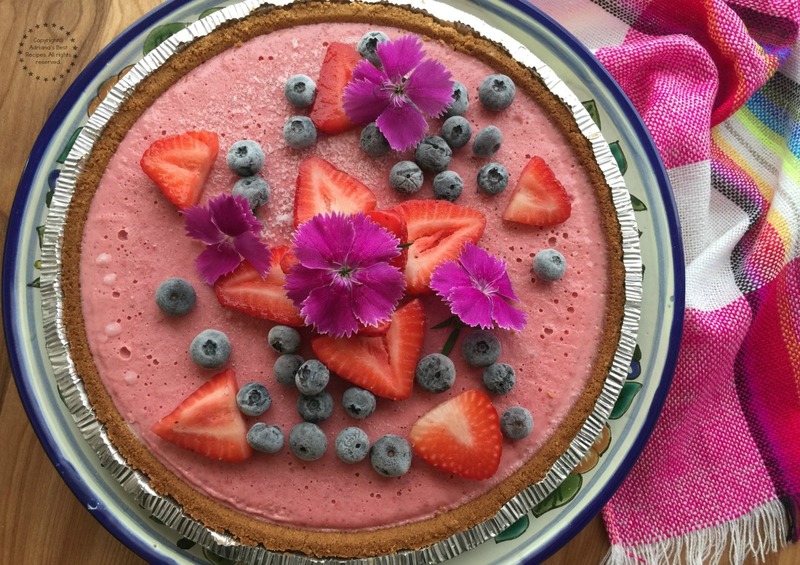 Temperatures are warmer and a Strawberry Blood Orange Frozen Pie is the perfect dessert to end a meal or to enjoy as a mid-afternoon treat for Mother’s Day or for any special occasion. Strawberries are still in season and I was lucky to have fresh blood oranges from my last run to the farmers market and thought would be really nice to combine both fruits which resulted in a very nice combination for a pie filling. Using fresh fruit it is always a good decision. 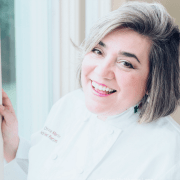 Every time I have the chance to use what I have available in my market it is not only less expensive but also a good idea to bring something special to my table. 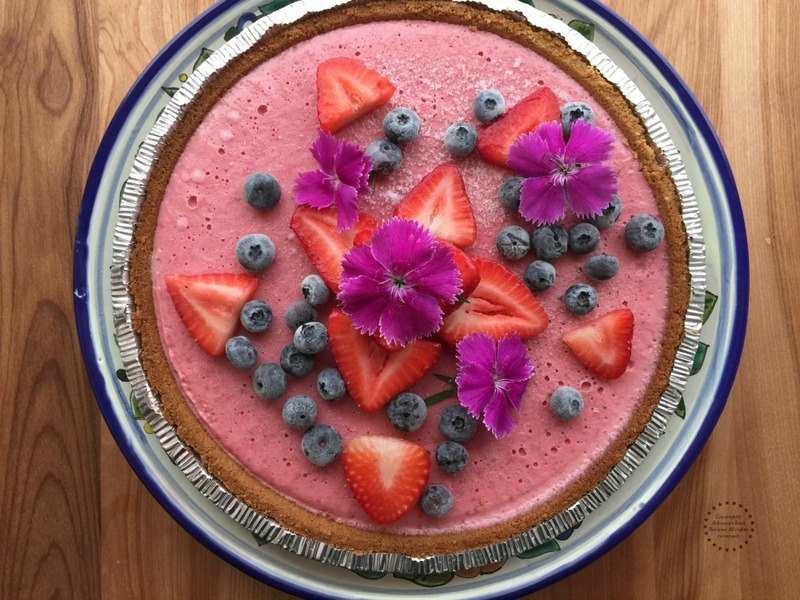 Temperatures are warmer and a Strawberry Blood Orange Frozen Pie is the perfect dessert to end a meal or to enjoy as a mid-afternoon treat for Mother's Day or for any special occasion. Strawberries are still in season and I was lucky to have fresh blood oranges from my last run to the farmers market and thought would be really nice to combine both fruits which resulted in a very nice combination for a pie filling. Make first all your prep by cleaning the fruit and then cutting and peeling the lime. On the blender add the full can of condensed milk, then add the blood orange juice and the lime juice. Add the lime peel and the strawberries and blend until all ingredients have a smooth consistency. Pour this preparation into the pre-made graham cracker pie crust and freeze overnight. 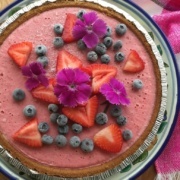 Before serving decorate the frozen pie with strawberries, blueberries and edible carnation flowers.You can serve with a side of whipped cream. This dessert to set requires minimum 5 hours in the freezer. You can make the night before and enjoy following day. 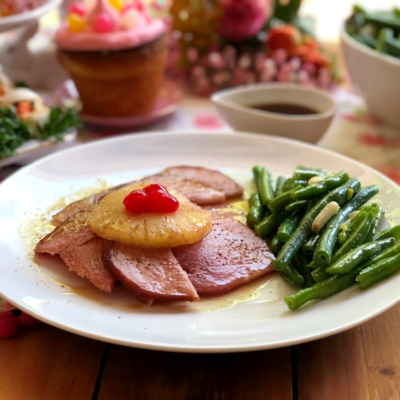 At home, my mom was used to prepare for ur many desserts that called for seasonal fruits. There was one that is still my favorite, the mango cream dessert, made with fresh manila mangoes and condensed milk. Very simple combination that allows using most fruits resulting in a flavorful fruity cream that you can use for parfaits, pies and ice cream. 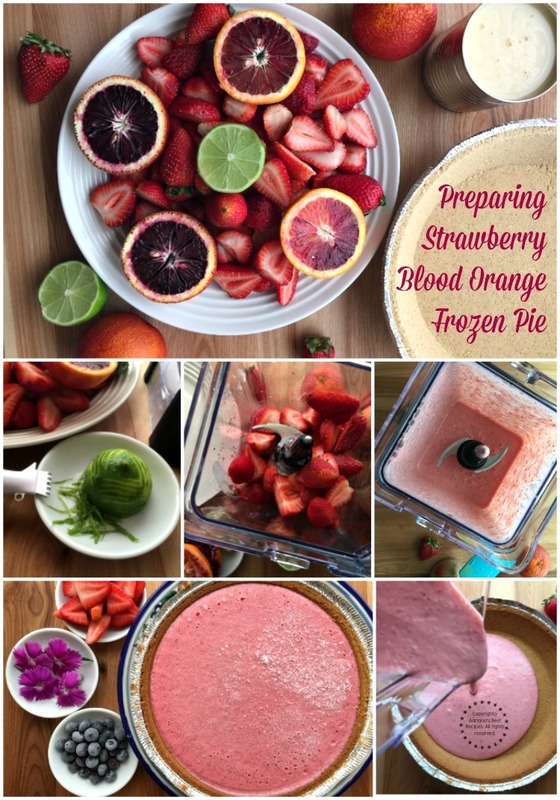 Which is exactly what I did with these strawberries and blood oranges to create this fun and easy recipe that I have called Strawberry Blood Orange Frozen Pie. 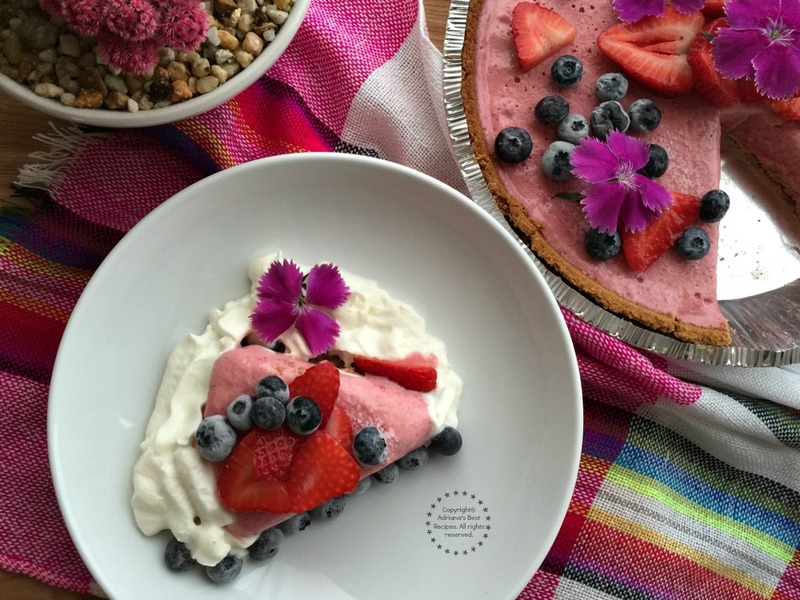 If you are looking for easy and fun desserts to prepare at home with no fuzz this Strawberry Blood Orange Frozen Pie it is a recipe that you need to add to your menu. It is simple, you can make it in just 15 minutes and freeze overnight, then you will have a frozen pie made at home that everyone will love. You really do not have to complicate yourself a lot in the kitchen. 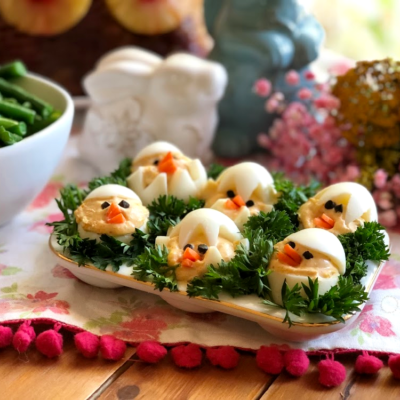 It is just a matter of finding those important cooking techniques and easy ingredients and you will be cooking in no time. This dessert is perfect for bringing to a potluck or a party too. Hoping you liked this recipe, I am sure it will become one of your favorite desserts. 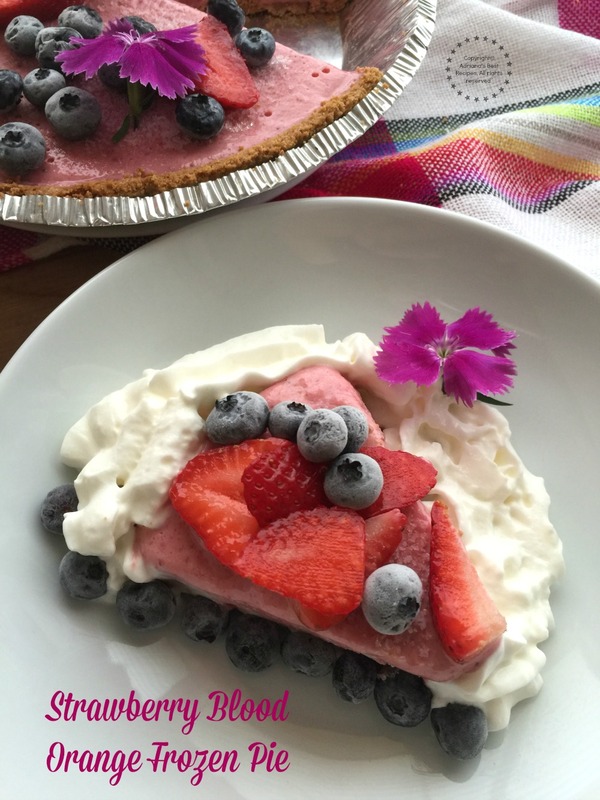 Let’s eat Strawberry Blood Orange Frozen Pie! How perfect is this!!! I love the idea of a blood orange pie. Sounds so heavenly! I agree blood oranges are a great ingredient to add citrus notes to a dessert like this, hugs! This looks amazing and love the pics! I can’t wait to try this recipe. I’m pinning this because it looks delicious and so beautiful! Adriana, este postre es de los que me fascinan. Fresquito, delicioso!!! So pretty and refreshing. 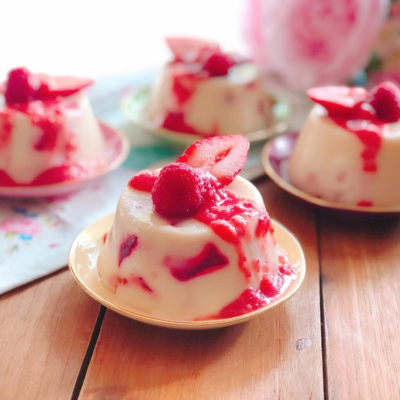 I love easy to make desserts and this one looks like a winner to me. Thank you for the recipe. Everyone is featuring a different recipe featuring strawberries! This makes me so happy, it’s one of my favorite fruits. This looks really good and perfect for the warm weather too. Thanks for the recipe! Wow, pero que rico se mira, me encanta que de haga con un poco de citricos! Esta receta está muy tentadora, creo que me la prepararé para este Domingo. SIMPLEMENTE WOW !!! HASTA PARECE QUE PUEDO SACAR LOS PLATILLOS DE ESAS EXCELENTES FOTOGRAFIAS … QUE BELLEZA, PERO SOBRE TODO ME IMAGINO QUE DEBEN ESTAR DELICIOSOS Y CON LO QUE ME GUSTAN LAS FRESAS… LOS VOY A PREPARAR. This is so mouth watering! I love strawberry in everything. Absolutely gorgeous. I love blood oranges and they have made the most beautiful pie. Really, I can’t take my eyes off how pretty this pie is! It would make such a nice Mother’s Day dessert. This looks so yummy! Perfect for a warm summer evening! My goodness, this looks absolutely delicious & mouth watering. Strawberry is my all time favorites & the combination of blood oranges, blueberries & condensed milk makes it a healthy recipe that anyone would fall in love! Que delicia, se me hace agua la boca, muchas gracias por la receta Yummy! 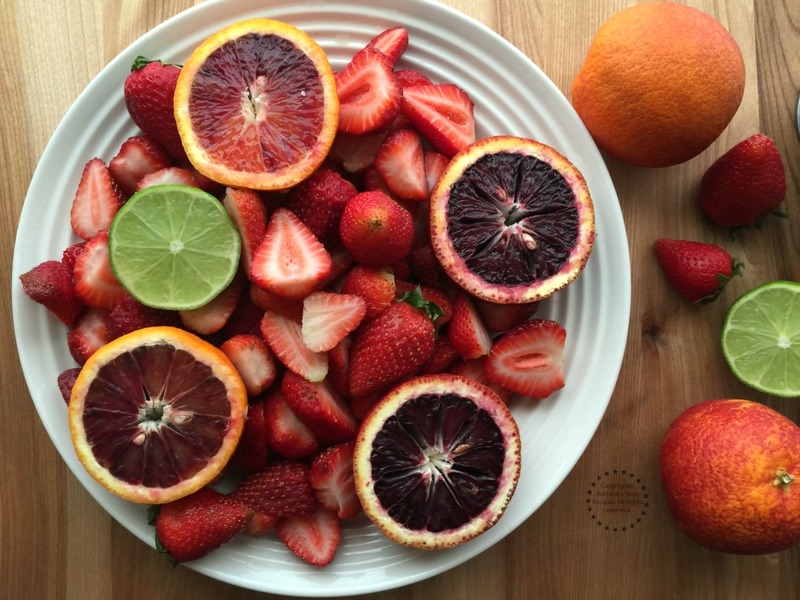 Blood oranges give such compliment to the strawberry color. Sounds like a perfect summertime pie! What a fantastic assortment of flavors in this pie. I love blood oranges, but have never had them like this. Eager to taste this. This pie looks amazing! We have blood orange trees and every season we enjoy them eating them fresh. Very creative way to use blood oranges in a pie! Oh yum! I have never had a frozen pie like this but it sounds so good! This would be great for a refreshing summer dessert. Thank you for the idea! Honestly we eat frozen homemade desserts and ice cream year long =) could not wait to try this till summer. Besides by then blood oranges and strawberries won’t be in season. Oh my mouth is watering with this one! It looks absolutely delicious. I really like that it uses fresh fruit. I will definitely be trying this recipe, thank you!